All that experimental brain testing they did in the last movie that made the apes smart also unleashed a viral infection that killed off most of the humans. Over the last 10 years, Caesar (Andy Serkis from “Death of a Superhero“) and the rest of the zoo escapees have multiplied and created a beautiful home in Muir Woods Park in Marin County. So the movie glossed over some critical things like 6 billion people dying and how the apes got a building permit in the Park. A small group of genetically immune, human survivors remain in San Francisco. They are struggling with diminishing resources and need electricity to try and connect with other survivors. Separate but equal was working just fine until Malcolm (Jason Clarke from “White House Down”) and his team enter the ape world to restart the hydroelectric power plant at the dam. Caesar senses their desperation and agrees to give them access. 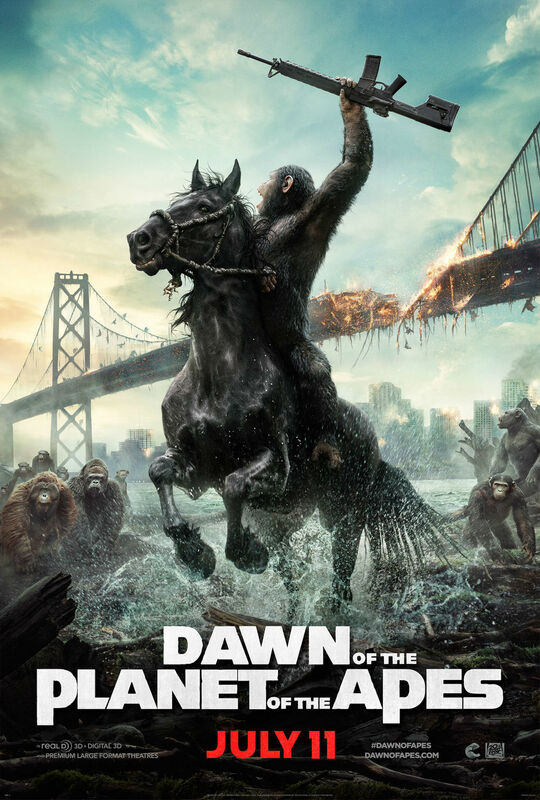 Many of the other apes do not share Caesar’s trust of their former oppressors. Caesar’s understanding of humans is an asset and a liability. “Ape shall not kill ape” is their number one law. For humans, thou shall not kill shows up sixth on the Commandments list, as if humans still follow their original rules. We can see the parallels in societal evolution and family values. The quest for power and the burden of leadership is universal. Hate has to be taught. Therefore, both species lack trust and the will or strength to forgive. Malcolm and Caesar share this vision, but most of the others can’t see past their angry fists. The values we teach our children are more important than anything else we could achieve. I know I learned that everything radical starts in California. This movie attempts to keep the threads of the original movies connected using 3-D CGI and stunning action sequences. It’s not as charming as the original, but it looks cool, and maybe that opens the door for some of the thought provoking moments. They do such a good job with the apes looking and acting like apes, it is hard to see their humanity. That may be the point, that most humans make a snap judgment based upon their outward appearance and do not get the time to know them. You understand their motives and sympathize with their plight, but the only ape I felt any connection to was Caesar. I applaud the filmmakers for using their special effects to illuminate and not just ignite the powder keg of problems presented in this movie. For that reason, I am giving this movie 4 stars out 5. I will be interested to see what they do with the next revolution.